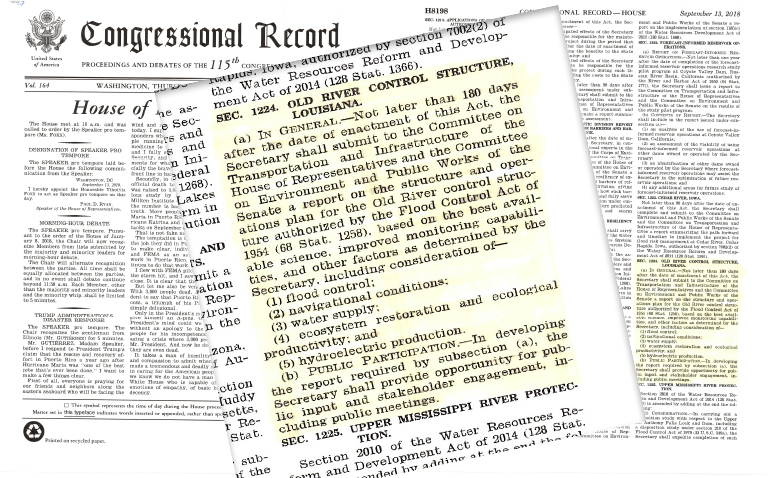 A report on the structure and operations plan for the Old River Control Structure authorized by the Flood Control Act of 1954 is to be submitted based on the best available science, improved monitoring capabilities, and other factors as determined by the Secretary, including consideration of flood control, navigational conditions, water supply, ecosystem restoration & ecological productivity and hydroelectric production. In developing the report required, the Secretary shall provide opportunity for public input and stakeholder engagement, including public meetings. Read the full record here. Can you tell us where a good place would be to start speaking LOUDER!! I would be happy to spread the word. I am in Natchez and have property below Vidalia La on the inside of the levee that is been flooding more than ever before! You can tell your flooding story to the Mississippi River Commission at the High Water Inspection. Please follow this link for the registration. https://biggerpieforum.org/events/ Scroll over the event title to get to the PDF of the registration. The deadline is this week.